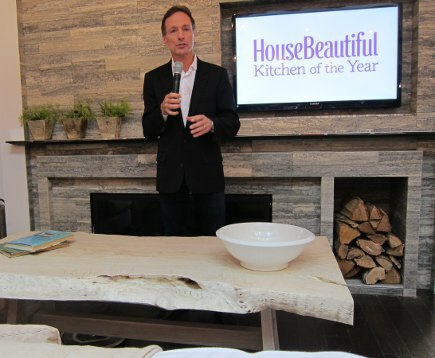 A NYC kitchen of the year show house features Mick De Giulio’s brand of exquisite kitchen design. 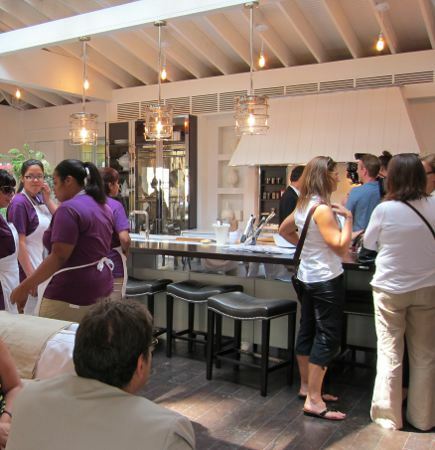 Rockefeller Plaza becomes a mecca for the kitchen obsessed when House Beautiful hosts their Kitchen of the Year show house. 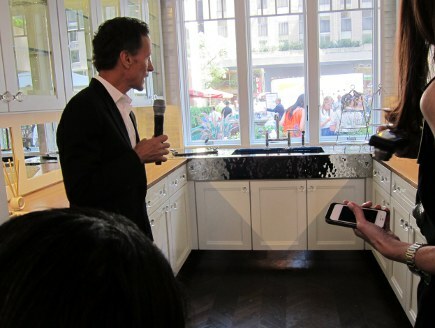 The featured designer, Mick De Giulio, is wearing a sport jacket as he gives about 100 members of the press a detailed walk-through the main kitchen and a jewel like butler’s pantry. De Giulio sets out the basic idea underlying this mostly white space: the kitchen is no longer simply a place to prepare meals, it has become the multi-purpose living hub of our homes. And he coined a name for this: “kitchen centric,” which happens to be the title of a lavishly illustrated book including 18 of his amazingly refined kitchens (Balcony Press, $65) published in 2010. For anyone seriously interested in kitchen design, or thinking about redoing a kitchen, De Giulio’s book is a must-read. The 1000-square-foot show house kitchen, the designer explains, is patterned after his own in suburban Chicago. 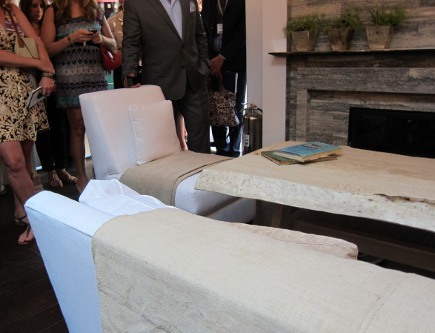 So it includes white linen upholstered seating (from Kravet, one of the magazine’s sponsors) and a bleached lychee-wood coffee table in front of a stone fireplace inset with a niche framing a Toshiba flat-screen. Nearby, next to French doors that open onto a terrace, is a dining table for family meals and guests gently lit by a memorable Ralph Lauren Roark aged-iron chandelier from Circa Lighting. Speaking softly and without notes, De Giulio explores each aspect of the kitchen from the idea or feeling that inspired it, down to the most technical detail of materials and fabrication. That expertise is not surprising given his 28-year career and award-winning work with Wolf/SubZero, Kallista, and SieMatic. Across the skylit room, the working area centers on a massive island that houses one of the sinks De Giulio designs for Kallista, Kohler’s most luxe brand. 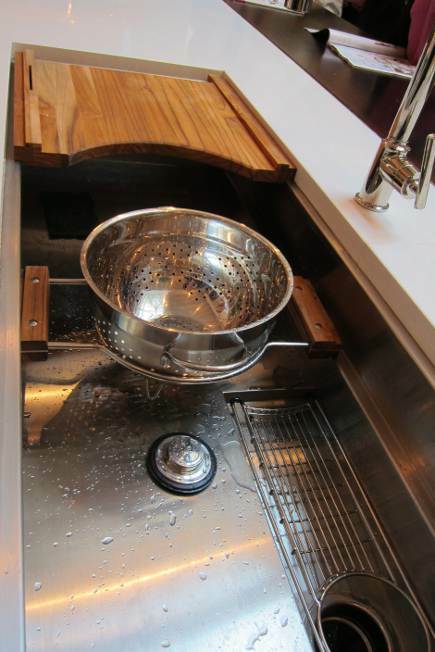 The 45-inch Multiere single sink has a tiered interior and slotted drain. Accessories include a sliding colander, utensil rack (which sits in the drain trough) and cutting board that includes knife storage and a sharpening steel bar in back that can double as a small towel rod. 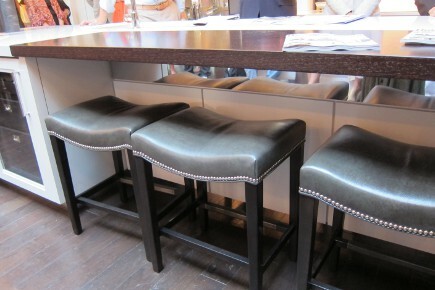 Low upholstered stools are tucked beneath a wenge wood eating bar on the non-cooking side of the island which has two different counter surfaces — the $250 a foot chocolate-colored wenge from Grothouse Lumber and Fair Lady Supremo Caesarstone paired to “de-mass” the island visually. The wenge wraps two edges in a broad L-shape and joining details are breathtakingly intricate. Together with all the drawer details, the island feels like the modern-day equivalent of 18th-century inlaid French mechanical furniture. 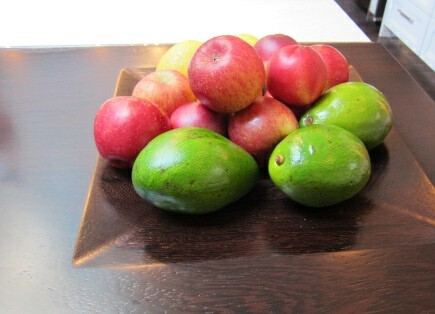 A concave “bowl” carved into the counter can hold fruit or prevent foods like eggs from rolling. 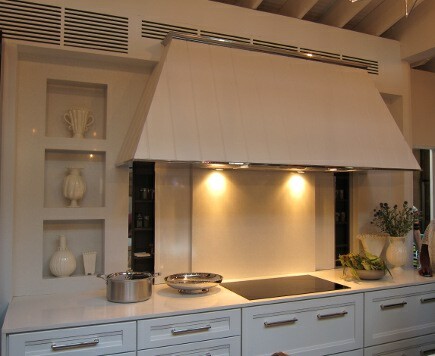 The main kitchen wall, behind island, focuses on an induction cook top crowned by the custom, stainless-edged vent hood — a defining feature for De Giulio. The counter top material is also used to panel the wall niches as well as the designer’s signature sliding backsplash panels that conceal spice shelves at arm’s distance from the cook. 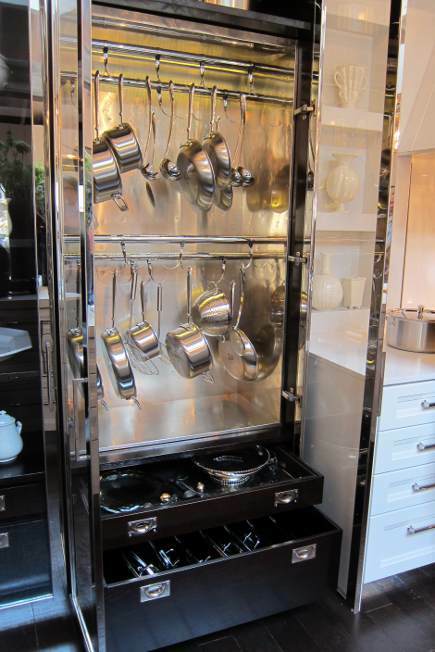 Adjacent to the cook top is a “metal-boy” cabinet — a stainless and glass-door showstopper for hanging pots that is lighted, lined with distressed German silver on the back and sides, and includes an custom divided drawer at the bottom for pot-lid storage. 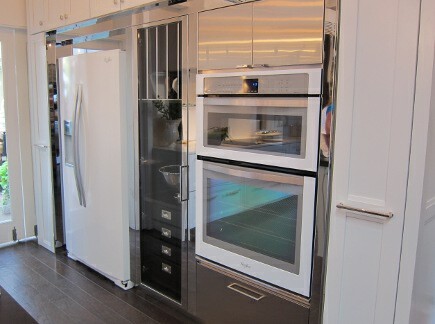 A second kitchen wall houses a refrigerator and wall ovens (both by Whirlpool) along with a trio of narrow pantries. 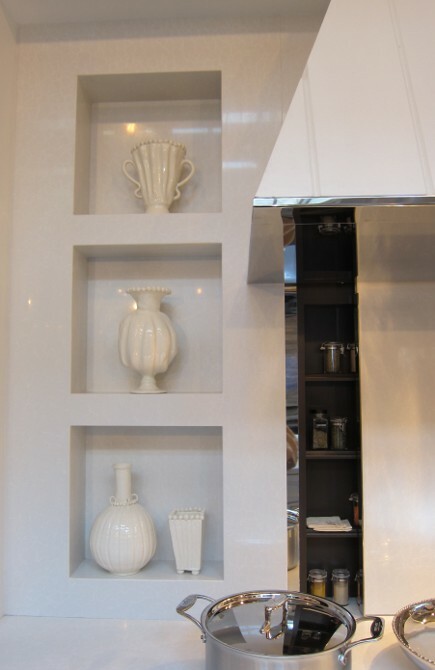 De Giulio refers to each wall as a composition due to the way the KraftMaid cabinets and other elements are framed. Then there is “la mattina,” or the morning space – essentially a drop-dead-gorgeous breakfast bar with open storage on a wall covered by Ann Sacks Davlin subways made from white gold-leaf fused between handmade glass tiles. This area does double-duty for clean up, supported a secondary sink — Kohler’s cast-iron enameled Riverby in a cobalt color called Annapolis Navy. De Giulio sees appliances as art when framed by the open doors of the appliance garage in the back of the extra-deep base cabinet. However, a flick of the finger can hide them when the cook’s mood turns tidy. 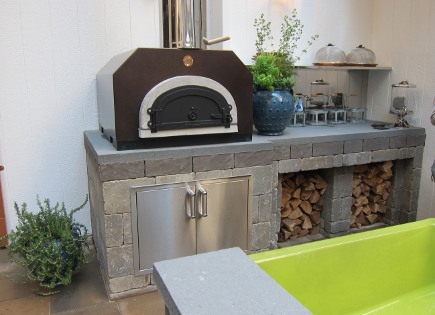 Additionally, there is an outdoor kitchen in the plaza that De Giulio designed around a wood-burning pizza oven. 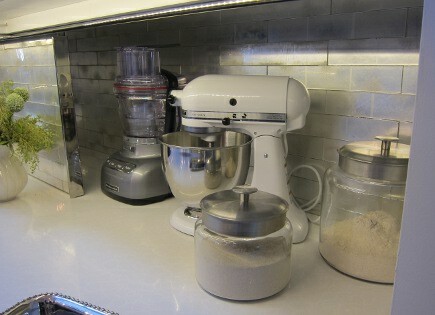 The Butler’s pantry is tiny, a mere 100 square feet. But Mick packs in the features there, too, and gives us a private video tour explaining his ideas for the little gem — in Kitchen of the Year Butler’s Pantry. OMG. I think I’m going to have to toss out the window half the things I thought I knew and loved about what makes for a great kitchen! Wonderful piece, Jane. Thanks for giving us voyeurs reason to drool and sigh! Thanks MV. I learned so much from reading his book (which I had to do to prepare to interview him) and then seeing the kitchen. The way it’s conceptualized and then executed isn’t like anything else I’ve seen and I learned so much. What I haven’t seen before is the way he deconstructs a kitchen from a functional standpoint then reconceptualizes it as a whole as a design. The finishing and framing details are legion. Someone will use an ogee edge on the top of a countertop but he will finish the underside and then you find out it’s done to hide something else you never thought about. That appliance wall is composed like 18th C architectural paneling. I’ve been amazed by the dismissive reaction without a single question on what’s important about it or what to take away. Sure, most people can’t afford to line a cabinet with silver or back cabinets with mirror. DUH. But what an amazing idea which can be executed so economically with paint almost to the same effect! There is SO much here. Obviously the finishes and details are upscale and pretty (love the lighting over the island), but the function tucked in is so wonderful. –The hidden spices, the pots and pans cupboard, and the wonderful breakfast counter that holds and hides a ton of equipment right where you can use it. And the sinks… No longer just a water source and the ‘white t-shirt’ of the kitchen, especially that one I see in the glimpse of the butler’s pantry. Ick. To me it just looks overdone, cluttered, and very, very impractical. There are too many dust-collecting spots (rafters, niches) and too many gimmicks. This is really unappealing to me! There was a big crowd and it was a bit difficult to take photos. And they didn’t leave either (there was nice breakfast food and drinks LOL). rhome, as always, you went right to the big idea. That sink is killer. I’ll never have one but what a joy it must be every day to work with a sink like that. 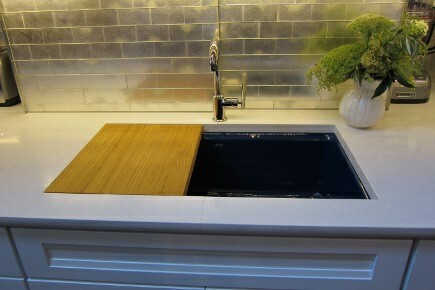 I did love the big deep sink I had in our apartment and I found a board to sort of fit. But the sliding stuff is what grabs me. And while he was talking about it and showing the features Mick said he spent 2 years working on the design with the engineers at Kohler and that they tweaked the pitch of the sink by 2% so it would drain better than most sinks. It’s the slot near the drain that fascinates me — like a chute for debris to go right down. Here’s a clickable close up. Nan, I’m confused by your focus on dusting. 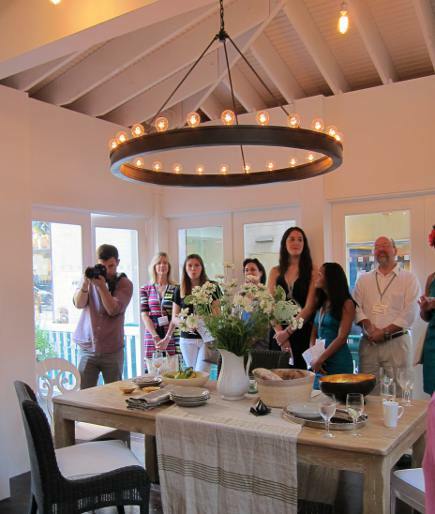 Mick De Giulio designs demo kitchens in Wolf/SubZero showrooms, he did Rachel Kohler’s kitchen (one reason Kohler produced his sinks) and he designed the Better Homes & Gardens test kitchens — spaces that are all about function. There are so many great ideas in this kitchen that can be taken away and done inexpensively. Sorry to see you miss out on them. That slot near the drain confused me, and maybe even looked like a negative, as I fight to keep things from going down the drain. It’s for a disposal, I’m guessing, which we aren’t allowed. Seems to me there is not much here to dust, since most things are hidden away. I do see fingerprint issues with the shinier surfaces (a personal pet peeve, since I have lots of oblivious fingerprinters), but I sure wouldn’t have to include those to use/incorporate some of the great ideas. I keep going back to the alcove for the small appliances. What a wonderful solution to wanting to have them ready to use without any fuss, but not wanting them crowding the counter or on display. Just wishing for a better overall view of the the island, the space, and how everything relates to each other. 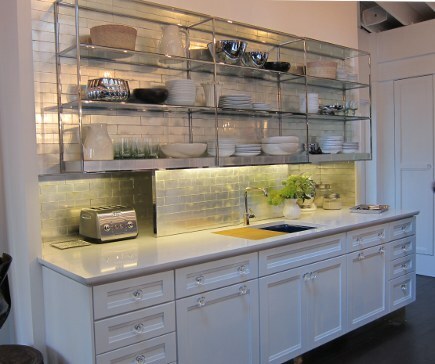 This is going on my list of favorite kitchens!!! Drool! I think dusting is an issue when people have these elaborate cabinets with corbels and pilasters and triple beaded doors which are total dust-catchers. Then they add curtains and accessories. This kitchen is so simple and low maintenance. People who think open storage and plate racks need to be dusted don’t have them. The truth is, you’re using the stuff all the time and it doesn’t get dusty. The sink is amazing but I think I might love the hood most of all. No wait… hmmm. Too many choices!